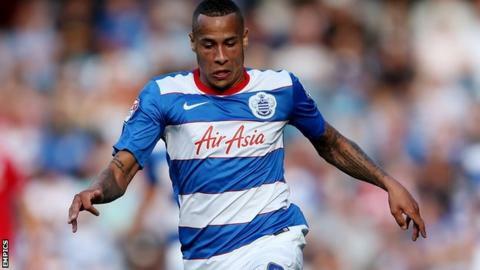 Tjaronn Chery and Charlie Austin both scored twice as Queens Park Rangers climbed to sixth in the Championship after beating Rotherham United. Dutch midfielder Chery hit his first two goals for the Championship club. But it was Austin who proved the main architect of victory, scoring QPR's third goal after laying on the first two either side of half-time for Chery. Rotherham got it back to 3-2 with goals from Jonson Clarke-Harris and Tom Thorpe, before Austin's late penalty. Just when it looked as if the Millers might complete an unlikely comeback after being three down with less than half an hour to play, Austin scored from the spot after Lee Frecklington was adjudged to have fouled home substitute Sebastian Polter. QPR director of football Les Ferdinand revealed on Friday night that QPR, who put a £15m price tag on Charlie Austin, have only received two official offers for the striker who hit 18 Premier League goals in 35 games last season - from Leicester City and Crystal Palace. The Millers, who won on their first trip to Loftus Road in 1951 but are now winless in five subsequent visits, had cause to feel aggrieved to trail at the break after matching their hosts for most of the first 45 minutes. Austin set up Chery to drill his left-foot shot into the top-left corner from 12 yards just before half-time. And a fair proportion of the fans had failed to make it back to their seats by the time Austin proved playmaker again just five minutes after the restart. This time it was the sought-after striker's backheel that created the space for Chery to hit his second of the afternoon. And, on 63 minutes, Austin scored his third goal of the season. Rotherham, who have now won just one of their last 14 away games, gave themselves hope when Clarke-Harris received Frecklington's pass before cutting in to curl a low left-foot shot into the bottom-left corner. And, on 88 minutes, they were two-thirds of the way to a dramatic rescue when Thorpe struck from six yards. But the Millers were disappointed with the penalty decision which, less than a minute later, allowed Austin to make it four goals in four games. QPR chose this day to honour club legend Stan Bowles, the former England inside-forward, who has Alzheimer's disease. Manchester-born Bowles, 66, who scored 97 league goals in 315 league appearances for Rangers from 1972 to 1979 and won just five caps for England, looked in good physical condition when introduced to the crowd before kick-off. "Charlie Austin wants people to know that he's fit. He's reacted well today. He's reacted well all season. He scored another two goals and is running around like a two-year-old, so the comments seem to be unjust. "Everyone at the club was disappointed about the comments. But Charlie knows if you're going to be in the big time then people are going to be knocking you. He's taken it on the chin. If you're attacked from nowhere, out of the blue and unprovoked, you are going to defend yourself. "I hope Charlie Austin stays. No-one has give us any indication we are going to lose him, but obviously there is speculation. Ambition is a big thing. When you're a footballer you want play at the highest level you can." "For 42 minutes there was one good team out there, and it was us. We had a couple of half-chances but we didn't take them. "We got Chris Ramsey to change systems three or four times, and it was a good performance. But goals always change matches. "They had a good finish to be fair, after a good passage of play, and we're disappointed. We can certainly defend the third and fourth goals better, we know that, but we showed some character." Match ends, Queens Park Rangers 4, Rotherham United 2. Second Half ends, Queens Park Rangers 4, Rotherham United 2. Attempt missed. Chris Maguire (Rotherham United) right footed shot from outside the box is close, but misses to the left. Assisted by Joe Newell following a set piece situation. Tom Thorpe (Rotherham United) wins a free kick in the attacking half. Substitution, Queens Park Rangers. Cole Kpekawa replaces Tjaronn Chery. Corner, Queens Park Rangers. Conceded by Lewis Buxton. Goal! Queens Park Rangers 4, Rotherham United 2. Charlie Austin (Queens Park Rangers) converts the penalty with a right footed shot to the bottom right corner. Penalty Queens Park Rangers. Sebastian Polter draws a foul in the penalty area. Penalty conceded by Lee Frecklington (Rotherham United) after a foul in the penalty area. Goal! Queens Park Rangers 3, Rotherham United 2. Tom Thorpe (Rotherham United) right footed shot from the right side of the six yard box to the bottom right corner. Assisted by Danny Collins with a headed pass following a corner. Corner, Rotherham United. Conceded by James Perch. Michael Doughty (Queens Park Rangers) wins a free kick in the defensive half. Foul by Tom Thorpe (Rotherham United). Attempt blocked. Nedum Onuoha (Queens Park Rangers) with an attempt from the centre of the box is blocked. Assisted by Matthew Phillips with a cross. Corner, Queens Park Rangers. Conceded by Joe Newell. Substitution, Queens Park Rangers. Sebastian Polter replaces Massimo Luongo. Attempt missed. Greg Halford (Rotherham United) header from the centre of the box misses to the right. Assisted by Joe Newell with a cross following a set piece situation. Foul by Tjaronn Chery (Queens Park Rangers). Chris Maguire (Rotherham United) wins a free kick on the right wing. Chris Maguire (Rotherham United) is shown the yellow card for a bad foul. Substitution, Rotherham United. Chris Maguire replaces Grant Ward. Substitution, Queens Park Rangers. Michael Doughty replaces Alejandro Faurlin. Attempt missed. Tjaronn Chery (Queens Park Rangers) left footed shot from outside the box is too high. Assisted by Massimo Luongo. Attempt saved. Matthew Phillips (Queens Park Rangers) right footed shot from outside the box is saved in the top centre of the goal. Assisted by Massimo Luongo with a headed pass. Attempt missed. Matt Derbyshire (Rotherham United) right footed shot from the centre of the box is close, but misses to the left. Goal! Queens Park Rangers 3, Rotherham United 1. Jonson Clarke-Harris (Rotherham United) left footed shot from outside the box to the bottom left corner. Assisted by Lee Frecklington. Attempt missed. Matthew Phillips (Queens Park Rangers) right footed shot from long range on the left is too high from a direct free kick. Lewis Buxton (Rotherham United) is shown the yellow card for a bad foul. Charlie Austin (Queens Park Rangers) wins a free kick on the left wing. Substitution, Rotherham United. Aidan White replaces Emmanuel Ledesma. Goal! Queens Park Rangers 3, Rotherham United 0. Charlie Austin (Queens Park Rangers) right footed shot from outside the box to the bottom right corner. Assisted by Robert Green. Grant Ward (Rotherham United) wins a free kick in the defensive half. Offside, Rotherham United. Jonson Clarke-Harris tries a through ball, but Matt Derbyshire is caught offside.